It was the year of the winged bangs and I was hell-bent on having them. Despite being born with a headful of ringlet curls and living in an oppressively humid climate, I wanted to belong. I was 14, it was the 1970s, and a world of adolescent males awaited me. 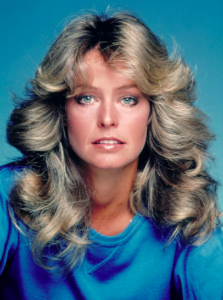 That is, if I could tame my damn hair (Farrah Fawcett style) and miraculously find a way to make perfectly flat wings last for an entire school day. God knows I tried. I slept on my back. I bobby-pinned my bangs en route to high school. I went to the bathroom 800 times during the day to fix them. Teachers were concerned that I was having plumbing issues. I took it all in stride, because I knew that everything I did was for the greater good of finding someone to notice me. It took patience to straighten my naturally curly hair. I was a teenager and had nothing but time. The days were long and languid. The sun hung in the air until after dinner. I spent every moment with Linda, my best friend. She would often sit on the edge of the tub and watch me struggle with a bristly round brush and a can of spray. In those days, my hair was as abundant as the amount of time I had to fuss over it. As soon as I mastered the skill of having wings, I had to cut them off. It was a routine blow-drying day, with Linda carefully watching as I tugged at the brush while simultaneously twisting it. Suddenly, nothing moved. I panicked. Linda tried to offer suggestions, to no avail. With the apparatus dangling from my hair in alien-like fashion and tears in my eyes, I screamed for my mother. After what seemed like hours, she produced a pair of scissors. My hair fell to the floor, along with my dreams of ever fitting in (straight hair style) with the cheerleaders and pretty girls who graced the halls of my school. It took years to learn that my curls were my greatest asset. By the same token, it took a long time for me to realize who I really was. I hoped college would be the place where I would blossom. I dreamed of the freedom it would allow and the opportunities I would have to make lifelong friendships. I hoped that the wings that fell to the ground and the blonde-haired cheerleaders of high school would all be a distant memory. But it doesn’t always work that way. Looking back, I wasn’t self-confident enough at 18 to let my hair go curly. I tried to fit in with everyone. I tried to be something I wasn’t. In the end, it backfired. Although I had a few girlfriends and a short-lived relationship or two, I never quite gelled with a group that would have my back forever. Any late bloomer will tell you how excruciating the wait can be. When I graduated college and moved to New York City, I decided it was time to let my hair be what it always wanted to be — long and curly. The city was filled with curly-haired girls who walked the streets with determination and focus. I wanted to be just like them. I stopped straightening my hair. I became strong, opinionated and full of the energy that continues to define me today. My hair was my secret statement — I could be just me and still be loved. Now that the kids are grown, I am purging our house of 20 years. Part of that exercise includes going through stacks of old photos. The shots of me at twenty and thirty include a giant mop of spirals cascading down my back. I’m smiling at a dinner with friends. I am snuggling my babies with a fierce love I never knew possible. My husband and I are on some fun getaway together. These photos show the best of me — how comfortable I am in my own skin, how beautiful I feel both inside and out. My girls were born with curly hair but they have gone the straightening/flat iron route. 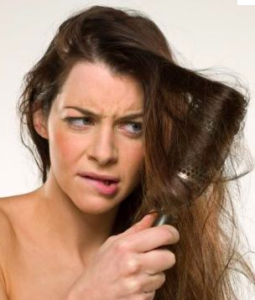 Apparently there is some study that shows that straight hair equals being taken seriously in the working world. Both girls are serious – about their careers, their lives and their abilities. They have a confidence I could never capture at 23. They have an abundance of friends and are good to each other and to my husband and me. They don’t need to be curly to feel liberated; they fly on their own regardless of their locks. My hair is thinning. Gone are the thick and curly tresses that I rediscovered in my twenties. It makes me sad — and think of how quickly time flies. But I also realize it is part of the aging process. I no longer have a lot of things I had in my youth, but in some ways I have so much more. 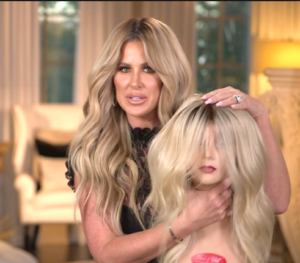 And there are many tricks to making hair look good (just ask anyone who has ever been a cast member of Real Housewives) and I intend on trying all of them. Curls are where it’s AT!